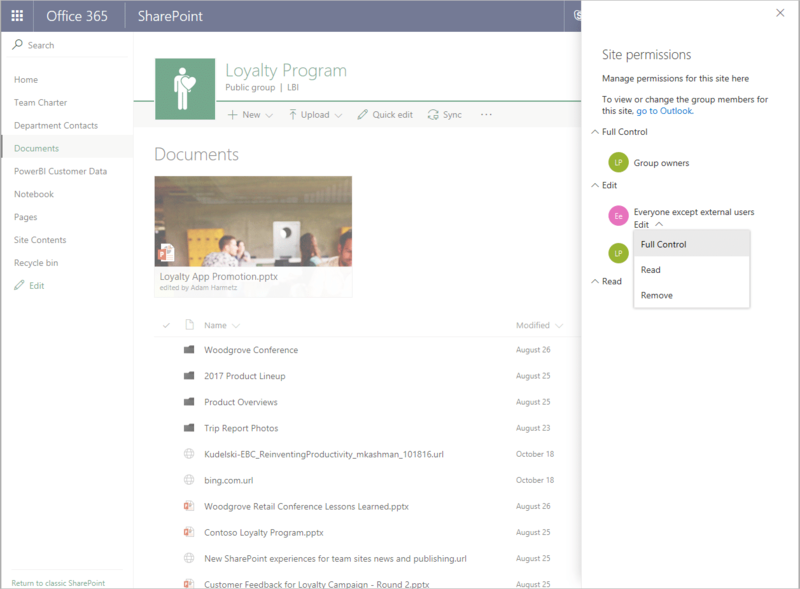 Office 365 now get full powered SharePoint team sites. 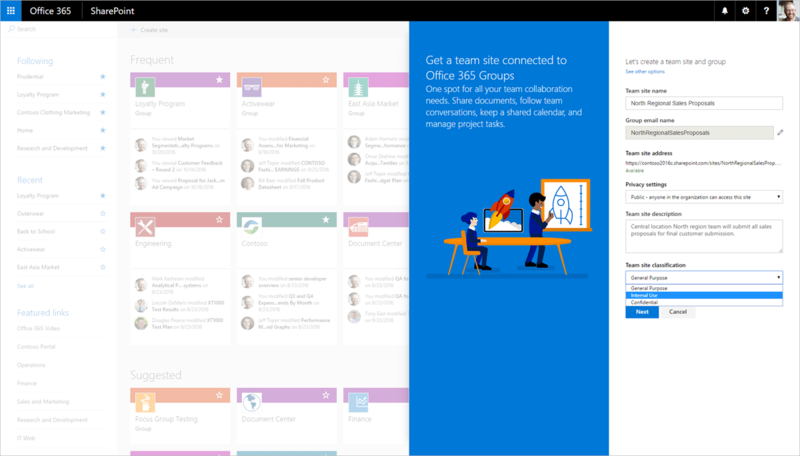 When you create a group, Office 365 gives the group a shared inbox, calendar, OneNote notebook, place for files, Planner for task management—and now a modern team site with pages, lists, libraries and team news, so the group can collaborate, communicate and coordinate. This is now fully available to all Office 365 customers. You are now able to create SharePoint team sites connected to Office 365 Groups from the SharePoint home in Office 365—and it’s fast. Admins control how these new capabilities appear for their users. And it is more intuitive to adjust the site as business needs require. Now, no matter where users create an Office 365 group (from Outlook, Microsoft Teams, Yammer and more), they will consistently get a full-powered, modern SharePoint Online team site. To work together as a team, people need to be adaptable, connected and mobile. In this modern era, it is essential that productivity tools, like SharePoint Online and Office 365 Groups, adhere to these very characteristics. Let’s dive in to the details of how to connect new sites with groups and making it lightning fast to get started. 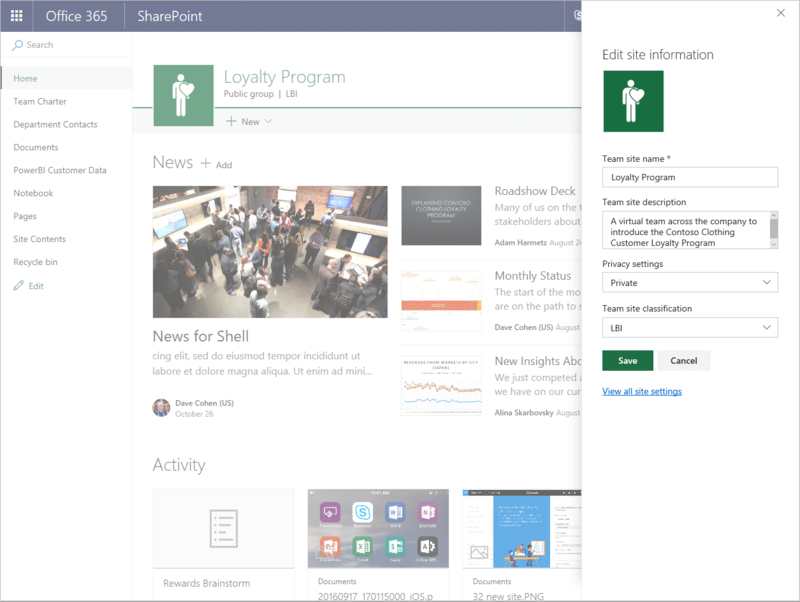 When it comes to managing information and building business apps, people turn to SharePoint Online team sites to create multimedia news articles, manage documents, track data in lists and more. Users can create SharePoint Online team sites connected to Office 365 Groups by clicking the Create site button on the SharePoint home page in Office 365. A two-step creation wizard will fly out from the right. Step one: Enter the title of the team site, select whether the group will be public or private, choose the site classification and then click Next. Step two: Enter the owners and members, click Finish and you’re done. A modern SharePoint Online team site is provisioned and ready for use in seconds. The Create site wizard is connected to Office 365 Groups and creates a SharePoint Online team site in seconds. What about managing the Create site functionality? SharePoint Online admins can control the user availability and behavior of the SharePoint home Create site button, and in cooperation, Office 365 global admins can control how site classification appears to highlight usage guidelines to their users. The updated Site Creation settings can be found in the SharePoint Online admin center—within the settings tab. 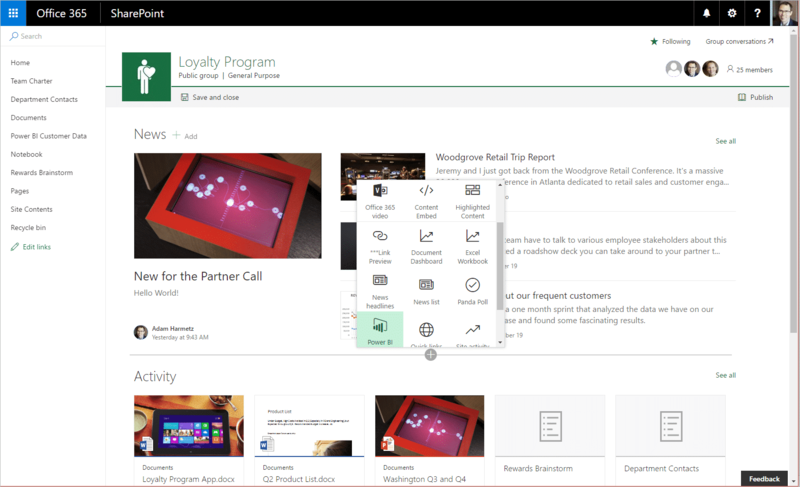 The new experience will let users create sites that include Office 365 Groups by clicking the Create site button on the SharePoint home page that starts the new Create site wizard. If you already enabled the original Start a Site for your users, we recommend that you review the new settings to ensure you selected options that meet your business needs. Admins control how Create site works using the Site Creation settings within their SharePoint Online admin center. Admins can manage whether Create site appears at all, and when it does, admins can adjust who sees the Create site button and what their provisioning experience should be (classic, modern or custom). As the entire SharePoint Online team site experience becomes more modern, users can more easily adjust commonly used settings without having to click multiple times into a classic site settings page—but rather accomplish tasks more intuitively within the context of what they are doing. Create your site to meet your team’s needs. The team site home page is now editable. This means you can go into Edit mode and add, remove and reorder your site’s various web parts. Do you need to see a rollup of certain content on a particular topic? Add the Highlighted Content web part, select the filtering criteria and watch as content adjusts dynamically based on search. Want to add a group forum discussion? Throw the Yammer web part in the mix. There are a lot of web parts already available, and more are coming. Also, as you add and adjust, you can be confident the page and web parts will look great on web and mobile (within the SharePoint mobile apps). When in Edit mode, users can use the toolbox to add new web parts to their home page. There is a modernized the experience for creating new lists and document libraries, to help users add value to their team sites right from the top portion of the team site home page, instead of multiple clicks in. Click + New, choose the new component from the drop-down menu, and out pops the create wizard. Click + New > List to bring up the inline creation pane to provide details, and then click Create. Microsoft has also brought forward in-line editing of left navigation elements, a nice feature that helps site owners encourage all members to find and make use of the site’s full capabilities. Easily add new URL links to the left-hand navigation and adjust where and how the link shows up in the left-hand nav. As needs change—for instance, a project codename getting a final public name—Microsoft has built in to the modern team sites experience a new way to edit site properties without leaving the home page. The editing panel is available for connected Office 365 Groups sites—accessible from the top-right gear menu. It allows owners to update the site name, description, privacy level and classification. Changes made here will also be reflected in the group. Beyond site information, site owners may want to further refine the level of access group members have when working in the team site. For this a site permissions panel for connected Office 365 Groups sites—also accessible from the top-right gear menu. Owners of public groups will particularly appreciate how easy this makes it to decide whether non-members should have full edit permissions, or whether public access should be limited to read-only viewing. It is now possible to create a modern page in a classic team site and declare it as the new, modern home page. You simply go to the Site Pages library within Site contents. Create a new, modern page and add whatever web parts make sense for the front of the team site. Once it looks as you want it to, select the page from within the Site Page library and choose Make homepage from the command bar above. Your classic site just got a modern face lift. 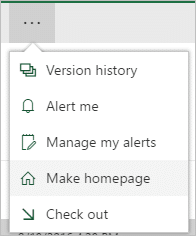 Select Make homepage to declare a modern page as Home in a classic team site. SharePoint Online team sites and Office 365 Groups bring integrated content collaboration to a new level. And there’s more to come, making it easier to create, use and manage content and information throughout the work cycle.